Large custom die cut pieces available up to 5 x 10ft. Often referred to as “noise curtains,” mass loaded vinyl barriers provide sound deadening functions for quieter operation of HVAC systems in commercial and residential buildings. Mass loaded vinyl (MLV) is used as a limp mass to enclose noise sources by draping around equipment, hanging between machinery, soundproofing ceilings and walls or attaching to equipment casing, thus providing sound deadening effects in and around HVAC systems. MLV can also be used to wrap pipes and ducts. LAMATEK’s MLV acoustical insulation can be provided in full rolls, cut to length or even die cut to fit custom applications. Large format CNC cutting is available for parts up to 5′ x 10′. Contact us for more information. If you can think it, we can most likely do it. Mass loaded vinyl is made up of Vinyl to give it flexibility plus a high density Barium Sulfate mass that provides a soundproofing element. 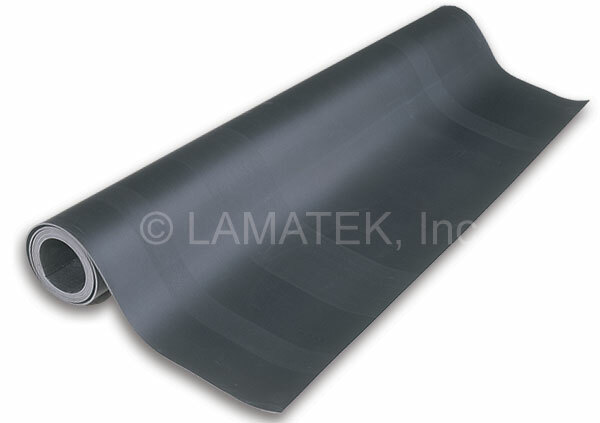 LAMATEK’s acoustic insulation barrier material is non-toxic and flame resistant. MLV is extremely thin and soft, making it a flexible option for a wide variety of soundproofing applications where other materials fall short. MLV is thin AND strong, making it an ideal choice for just about any soundproofing application. Other acoustical insulation solutions are hindered by temperature limitations and rigidness, which are two areas where MLV excels. The possibilities are endless when it comes to MLV. Contact us today to request a sample and get more information.